The Nashville Tennessean reported that RB LenDale White and OLB Keith Bullock have not attended the Titans’ offseason workouts. They also have not been in contact with the team. Bullock and White have locked their starting positions with the team. White’s weight problems up to last season kept him from a starting job. Now, he has three misdemeanors under his belt stemming from a run-in with police in his hometown of Denver. LenDale’s always had questionable motivational and workout habits. So where’s LenDale now when he should be working hard for the 2008 season and showing the Commissioner that he’s not a selfish punk rather than a dedicated football player. In 2007, LenDale carried the rock 303 times for 1,110 yards and seven touchdowns. Bullock, who’s become one of the league’s best outside linebackers, had a slightly worse season than years past but that may be due to team’s avoiding attacking his side of the field. In the past three seasons, Bullock totaled 270 solo tackles, 7.5 sacks, eight interceptions, four forced fumbles, 25 pass deflections and one defensive touchdown. 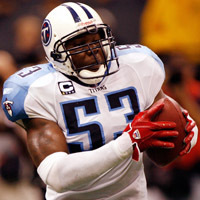 The veteran’s leadership for the Titans D cannot be denied, but missing offseason workouts is not ideal when DT Albert Haynesworth is dealing with off the field issues, such as wanting to change teams and his divorce with his wife.